Mainstream psychiatry has fooled the public – and perhaps themselves – into believing that (a) they are the most expert professionals in mental health, and (b) their primary interest is the public good. Neither of the above is true. 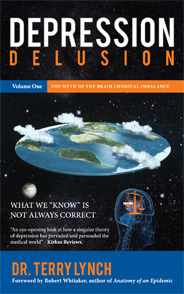 Most mainstream psychiatrists have a grossly inadequate understanding of the emotional and psychological worlds of the masses of people they claim to understand, in addition to their exaggerated and frequently deluded view of the brain and claimed (but scientifically unverified) brain abnormalities. MAINSTREAM PSYCHIATRY IS NOT TO BE TRUSTED. THE MAIN PRIORITY OF MAINSTREAM PSYCHIATRY IS NOT THE PUBLIC WELLBEING. THE MAIN PRIORITY OF MAINSTREAM PSYCHIATRY IS MAINTAINING AND ENHANCING ITS OWN POSITION AT THE PINNACLE OF THE GLOBAL MENTAL HEALTH PYRAMID. GOVERNMENTS OWE IT TO THE PUBLIC TO INITIATE INDEPENDENT INQUIRIES INTO MENTAL HEALTH, INCLUDING THE WIDESPEAD ASSUMPTION THAT PSYCHIATRY SHOULD LEAD THE WAY IN GLOBAL MENTAL HEALTH. IT IS HIGH TIME THAT GOVERNMENTS THAT BACK PSYCHIATRY’S DOMINANT POSITION IN GLOBAL MENTAL HEALTH WOKE UP TO THESE REALITIES. Over the years, I have come across dozens of examples of psychiatry’s incompetence, ignorance, bias, delusional thinking, and cunning. Yet another classic example of this occurred in October 2018. As I described in my 2018 Kindle book publication ‘Prescribed Drug Dependence’, mainstream psychiatry has systematically underplayed the drug-dependency potential of the substances they prescribe so frequently and with such enthusiasm and conviction. Based on people’s experiences of taking the substances, it has been clear to me for the past twenty years that the much-promoted SSRI antidepressants frequently cause drug dependence and withdrawal problems. Because it would reflect very badly on psychiatry to be seen as prescribing substances that – like illicit street drugs – regularly cause drug dependence and withdrawal problems, mainstream psychiatry has vehemently and consistently resisted significant withdrawal problems being associated with the substances we call SSRI antidepressants. More than half experiencing withdrawal effects; almost half of those experiencing withdrawal describing them as ‘severe; withdrawal effects commonly lasting several weeks or months. These are very significant findings. 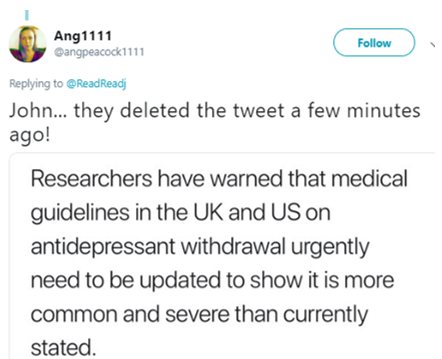 To those of us who have been honest about the withdrawal problems caused by antidepressants, these findings come as no surprise. So, the mainstream media rightly took this research very seriously. What about mainstream psychiatry? What was psychiatry’s reaction to this research? Wendy Burn’s comment – ‘Good to see research in this important area’ seemed disingenuous to me. 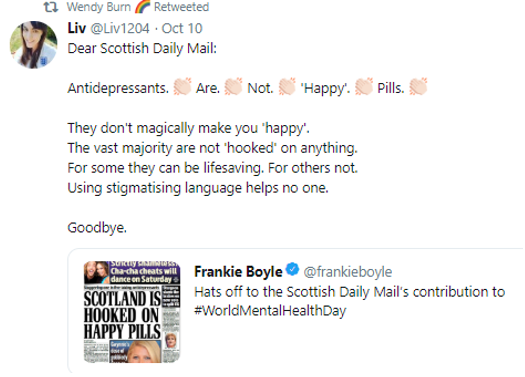 In my tweet, I was making the point that this research came not from the prescribers of these substances – psychiatrists and GPs – but from two very conscientious psychologists. I was also asking an important if rather obvious question: Why were psychiatrists not undertaking such research, given that drug prescribing comes under their remit and responsibility? Wendy Burn is quite active on Twitter, generally posting tweets and retweeting many times a day. So is Carmine Pariante and the Royal College of Psychiatrists. Simon Wessely is also quite active on Twitter. Though notified about my tweet by me, not one of them bothered to reply. I looked through the tweets and replies sent by Dr. Wendy Burn over the following days. 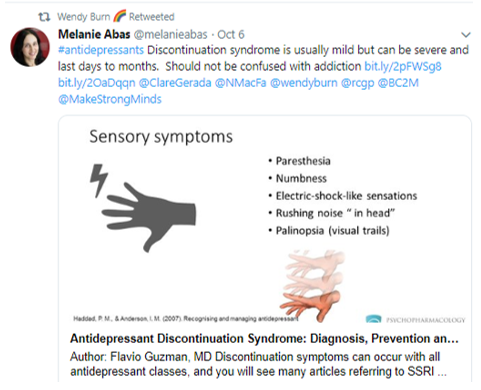 I found just two tweets – or rather, retweets; Wendy Burn apparently did not see this research as important enough to comment further. 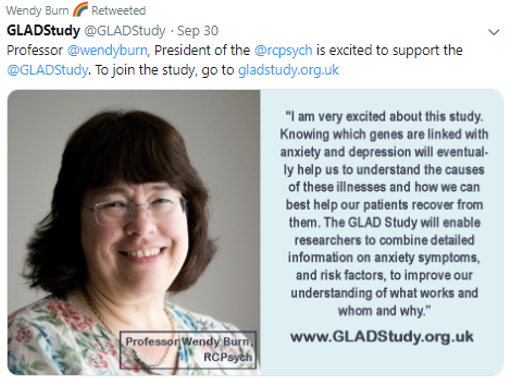 I believe that Wendy Burn’s true position – and the position of the Royal College of Psychiatrists, of which she is currently president, the college’s most senior representative – reveals itself in the two tweets – out of the hundreds of tweets about this antidepressant withdrawal research – that she chose to retweet. There is no indication to suggest that the Royal College of Psychiatrists intend to take this research seriously. 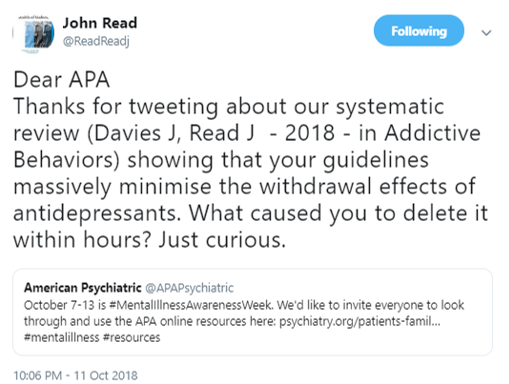 The American Psychiatric Association did not reply to John Read. 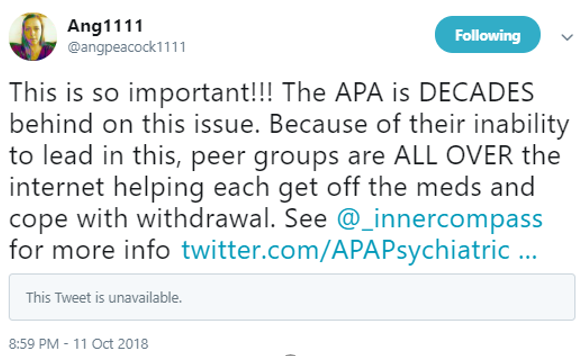 Why would the American Psychiatric Association delete this tweet and refuse to explain why? This is an example of the duplicity and cunning that is endemic within mainsteam psychiatry globally. Clearly, someone within the American Psychiatric Association felt it approriate to respond and tweet about this important research. 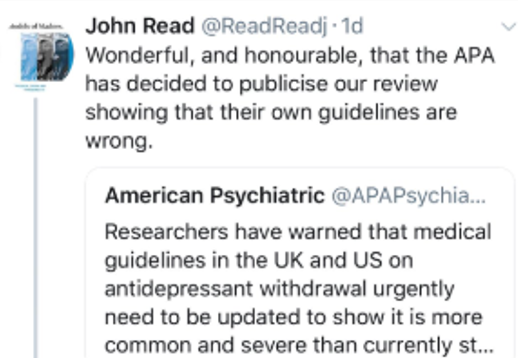 It would appear that this decision to flag this decision was subsequently – a few hours later – overrided by more powerful voices within the American Psychiatrric Association, arrogant and poweful voices that also felt that the public did not deserve an explanation for their radical change of mind in relation to their tweet about this research. 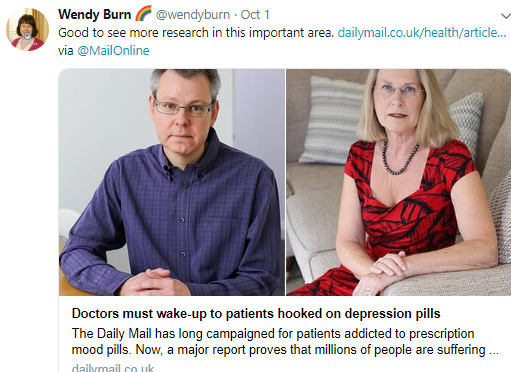 Agreeing with this research – as they did in their tweet – would raise serious questions about the correctness of prescribing these substances to vast numbers of people. 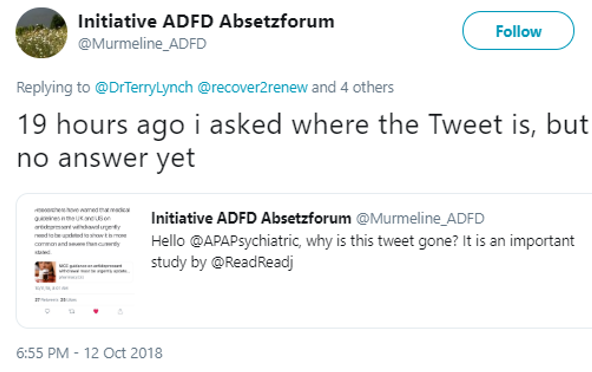 The unexplained removal of this tweet had nothing to do with the public interest, and everything to do with prioritising the image of psychiatry and the American Psychiatric Association. 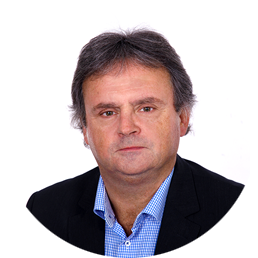 Why did it take two psychologists – John Read and James Davies – to carry out this research? 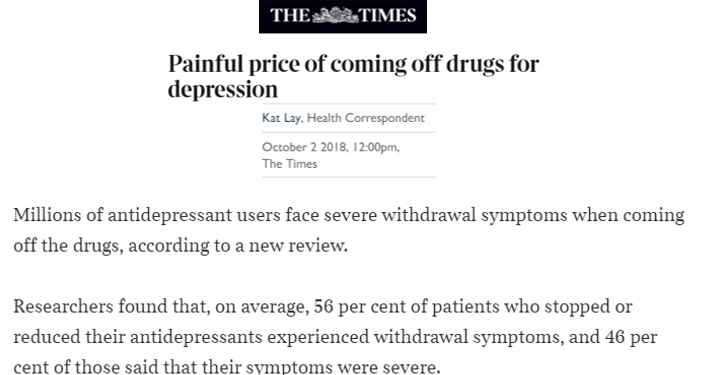 Where are the prescribers of these SSRI antidepressant substances – psychiatrists and GPs – doctors who have reassured the public for decades that there are no signficant withdrawal problems associated with these substances? 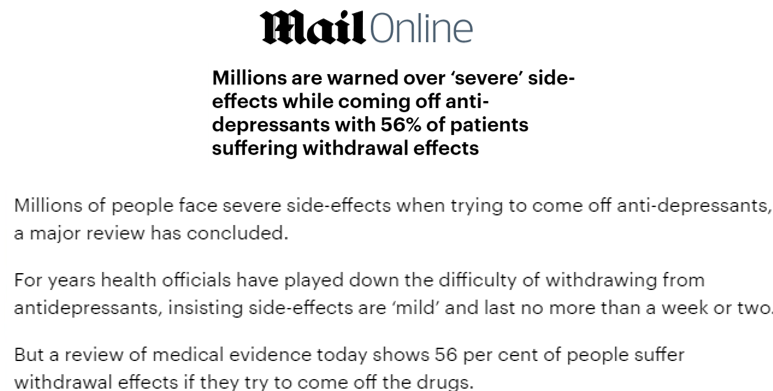 Why have the enthusiastic prescribers of these substances – psychiatrists and GPs – who have continually informed the public that there is no need to worry about withdrawal problems, not carried out research such as this decades ago, before these drugs were unleashed upon an unsuspecting and trusting international public? Why are the prescribers not on top of this issue, taking the lead – as any responsible profession would – in relation to the substances they prescribe so widely? 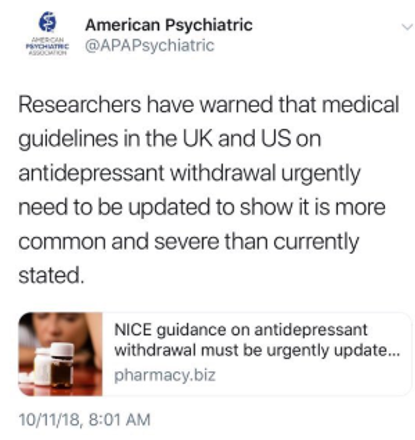 Why do the prescribers seem to want to know little or nothing about the major issue of prescribed drug dependence, as evidenced by the underwhelming response of the Royal College of Psychiatrists and the American Psychiatric Association to this important new research? Mainstream psychiatry’s refusal to take such findings seriously and address the issues that arise inevitably leaves the vast numbers of people who experience severe antidepressant withdrawal problems alone, unsupported, virtual outcasts, leaving these people with little option but to support each other as best they can, through internet and other groups. This is yet another scandal. How many more scandals will mainstream psychiatry be allowed to get away with by our governments, who have ultimate responsibility for the health and welfare of nations’ citizens? When will governments do what they should have done decades ago – initiated an independent inquiry into mental health, including the practice and ideology of psychiatry, which falsely informs the public that its practices are scientifically valid and trustworthy??? Or will governments merely continue to wrongly assume that psychiatry is the ultimate source of mental health knowledge, wisdom and leadership, a deluded position that bears no relation to the facts? Thirty years in this field has taught me that it is a waste of time trying to encourage mainstream psychiatry to drop its biases. 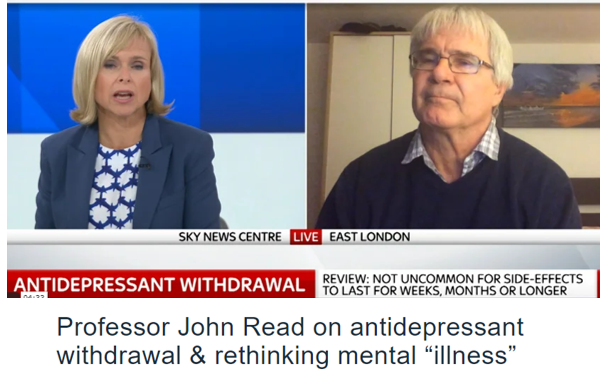 Change will only come when forces outside of mainstream psychiatry join and insist upon an independent review of how emotional and mental health is understood and addressed. This entry was posted in Blog, News and tagged American Counseling Association, American Psychiatric Association, American Psychological Association, antidepressants, antipsychiatry, brain chemical imbalance, British Psychological Society, chemical imbalance misinformation, counseling, counselling, critical psychiatry, depression, Depression delusion, Diagnostic and Statistical Manual of Mental Disorders, discontinuation syndrome, Dr. Terry Lynch, drug dependence, drug withdrawal, mental disorders, mental health courses, mental health education, prescribed drug addiction, prescribed drug dependence, psychiatric drug withdrawal, psychiatric drugs, psychiatry, psychology, psychotherapy, Royal College of Psychiatrists, SSRI drug dependence on 13th October 2018 by drterry.